Walking into the Frost Amphitheater is like entering another world. Enveloped in old-growth trees, the grassy, shade-dappled hollow is largely hidden from view, difficult to find unless you know precisely what you’re looking for. In fact, once you ascend the winding asphalt path to the very top of the amphitheater, it’s hard to believe you’re even at Stanford anymore. It was in this secluded, otherworldly venue that the 2015 Frost Music and Arts festival took place, drawing a diverse crowd of fans from within and outside the Stanford community. It was an ideal setting for an extravaganza of captivating trap, trip-hop and EDM – an all-day rave that satisfied the high expectations of everyone in attendance. Stanford’s own Siberian Front, an alt-rock outfit who claimed victory at Sprung Music Festival’s Battle of the Bands, started things off with an energetic set. As festivalgoers trickled in from tailgates and other events, the band drew a small but enthusiastic crowd. Frontman Thomas Reidy ’17 brought his trademark performance persona to the stage, sporting a patterned blazer and brimming with joyful charisma. Indeed, each member of the band clearly enjoyed the experience, playing with an abandon that did not compromise their instrumental skill or cohesiveness. The band rolled out a new, never-before-performed single, “Pheromones”, which received a hugely positive reception. The group is certainly more accustomed to playing smaller venues, a fact that came through in their relaxed stage presence and lo-fi aesthetic. 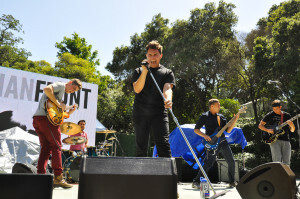 But though the band’s style contrasted with the slick, bass-heavy EDM that would dominate the stage as the festival proceeded, their performance set a laid-back, sun-drenched tone for the rest of the afternoon. After Siberian Front came AlunaGeorge, an electronic pop duo hailing from Great Britain. Like later performers Kaytranada and Flume, the group’s appeal is firmly rooted in atmospheric, heavily processed production, but their set felt a little more grounded, closer to what one might expect from a traditional live performance. Their spare instrumentation consisted of a keyboard, a few background samples, and vocalist Aluna Francis’s ethereal soprano. The results were pleasant and danceable, but sometimes faltered. Certain melodic riffs came out jagged and exposed, and Francis occasionally struggled to hit her notes. Nonetheless, AlunaGeorge provided an excellent transition from Siberian Front’s opening set, conjuring an out-of-body, rave-centric mood that persisted for the rest of the festival. 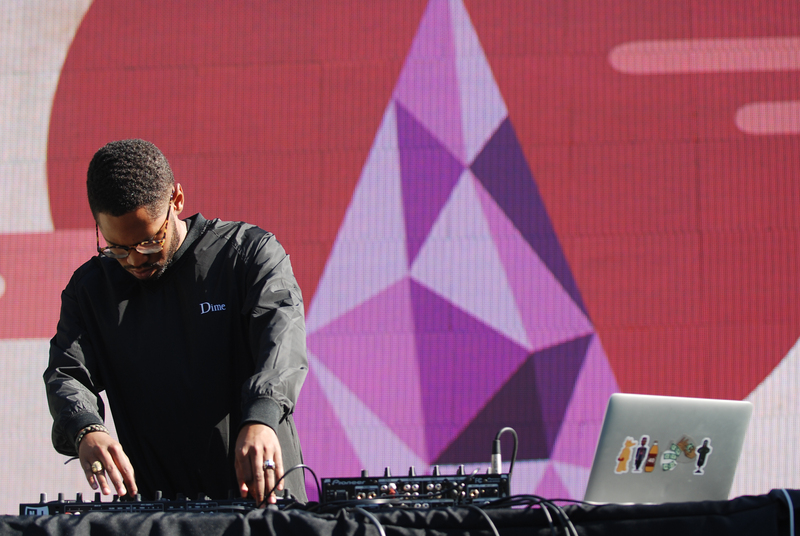 Next up was Kaytranada, a Montreal-based DJ whose haunting beats and unconventional production style made the amphitheater, already an otherworldly place, feel like another planet. 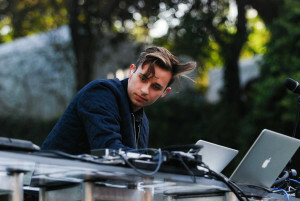 In comparison to AlunaGeorge and Flume, much of his music veers toward the ambient and experimental. Lacking the heavy bass drops that punctuate most EDM hits, tracks like recent single “At All” feel more appropriate to chilling in a hammock than they do to a full-volume festival environment. The crowd seemed to appreciate the set nonetheless, allowing themselves to be swept away by unfamiliar but catchy grooves like “Hilarity Duff.” Especially towards the end of the set, Kaytranada showcased his flexibility by magnifying the bass and snares in many of his remixes, demonstrating his ability to cater to the festival crowd. He spent his time onstage striking a delicate balance between pleasing the audience and staying true to his artistic identity, and appeared to enjoy every minute of it. After Kaytranada came the headliner that everyone was waiting for: Flume. Though the preceding acts held their own, the Australian DJ blew his set out of the water. Delivering hit after hit, he captivated the crowd, masterfully mixing beats and samples to recreate favorites like “Sleepless” and “Holdin On.” Seeing a DJ in a live performance has the potential to be underwhelming – there’s something about the chemistry and magic of honest-to-goodness live music that electronic equipment can’t recreate. But Flume’s creative production and onstage charisma yielded a lively performance that did not disappoint, regardless of venue or genre. From dark, downtempo tracks such as “Insane” and “Left Alone” to bass-driven hits like a beloved remix of Lorde’s “Tennis Court”, he had the crowd completely under his spell. From a critic’s perspective, the highlight was a remix of Major Lazer’s “Get Free,” a product of What So Not, Flume’s collaborative side project. After a suspenseful, roaring lead-up featuring a searing vocal sample from Amber of the band Dirty Projectors, the DJ laid down a ragged, trap-flavored drop that took the audience completely by surprise. The moment, which simultaneously defied and exceeded the crowd’s expectations, was emblematic of his performance as a whole. Though live EDM concerts are often quite similar to downloads and recordings, Flume’s layered, festival-ready trip-hop was even better in person. 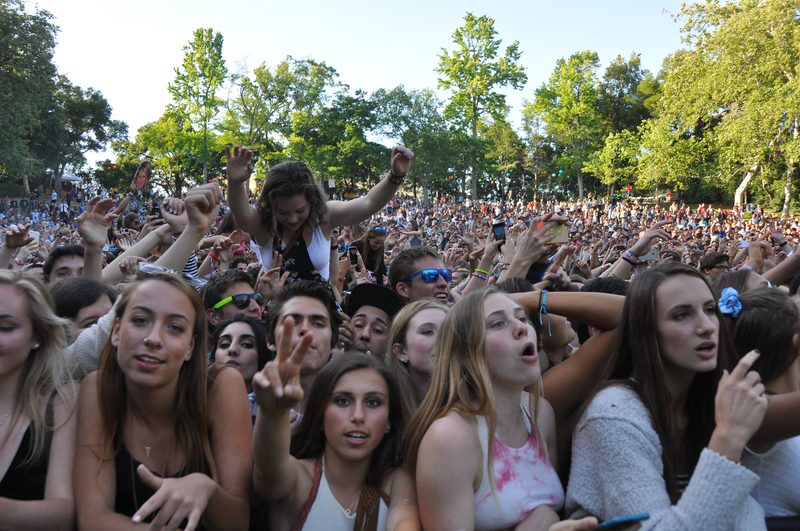 In sum, Frost 2015 was a musical experience that Stanford won’t soon forget. Kick-started by the enthusiasm and craft of student band Siberian Front, performers AlunaGeorge, Kaytranada and Flume transformed the Frost Amphitheater into a dreamlike refuge of sun and sound, honoring their artistic identities while captivating the crowd. For five wild hours, Stanford students left their myriad stresses and obligations behind the trees, entering an alternate world of memorable music and laid-back community. Grassy, secluded, and picturesque, the amphitheater could not have been a better setting for a rave to remember.